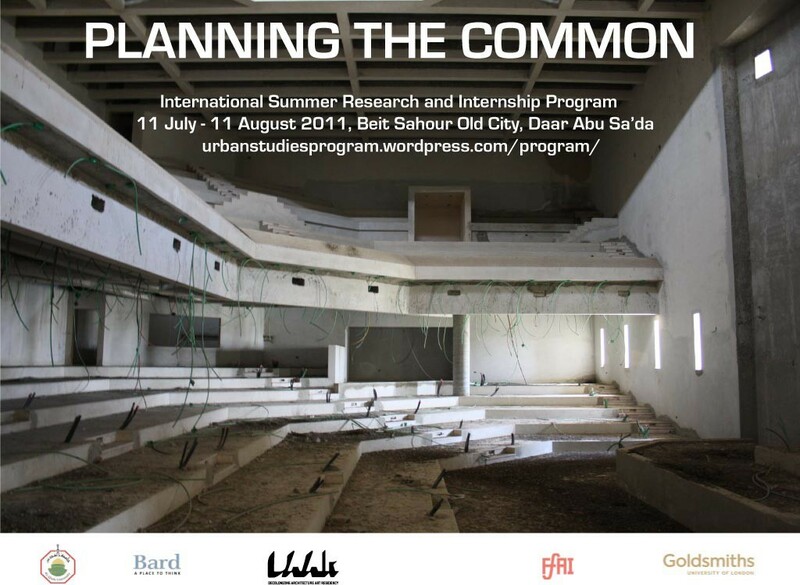 “Planning the Common” is the second collaborative partnership of its kind between the Al-Quds Bard Honors College and DAAR (Decolonizing Architecture/Art Residency) in collaboration with the Goldsmiths University of London and Supported by Foundation for Arts Initiatives and the Municipality of Beit Sahour. The International Summer Research and Internship Program will take place during the summer of 2011 in Beit Sahour, near Bethlehem, involving the participation of students, architects, NGO staff and village officials. The residency will involve 15 international architects and artists, 15 students from the Al-Quds Bard Honors College as well as local and internationals experts invited for the lectures and seminars. Students will earn 3 academic credit hours for participating in the program. The idea around which the summer program is organized is to engage with the empty building of the The Palestinian Legislative Council building in Abu Dis (the Palestinian Parliament) imaging its reuse as a new common. The construction of the building started during the euphoria of the Oslo Accord. The location in Abu Dis was chosen as a first step toward the establishment of East Jerusalem as the Capital of the future Palestinian State. With the collapse of the Oslo Accords, the eruption of the Second Intifada and the construction of the Wall just few meters from the building, the project has been abandoned to itself. Today its massive presence and incompleteness dramatically embody the frustrated ambitions of the Palestinian political leadership. Crucial questions centered around the notion of political representation and architectural form, seem to emerge: how the building could be re-imagined as an extraterritorial assembly that will include the Palestinian population exiled outside the country? How could a reflection on the public and the common could politically revive the abandoned building? Is this building the ultimate form of the Palestine assembly and democracy or do new political and architectural forms need to be reinvented?